To get started with Plans & Charges, please click here. The Plans in your organization might depend on the product that you sell. The plan could be a daily, weekly, monthly...etc. Lets us start with Plans and see what are the various options we have under Plans. Let us take an example as below to explain the functionalities of Plans and Charges. Now let us start implementing the above Plans and Charges in the system. Plan Name: You can enter the name of the plan here. For eg: ‘Video Rental Unlimited Plan’ is a monthly plan where the user gets access to unlimited video access for a Monthly Charge. 5. 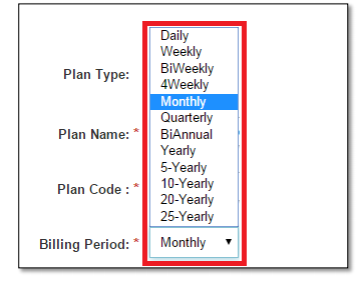 Billing Alignment: In the image below, ‘Bill to the end of current period’ indicated that the customer has to be billed during the End of the Month i.e. 1st of every month and ‘Bill for a complete period’ indicates that the customer has to be billed on a particular date every month i.e. 20th to 20th of a particular month. 6. 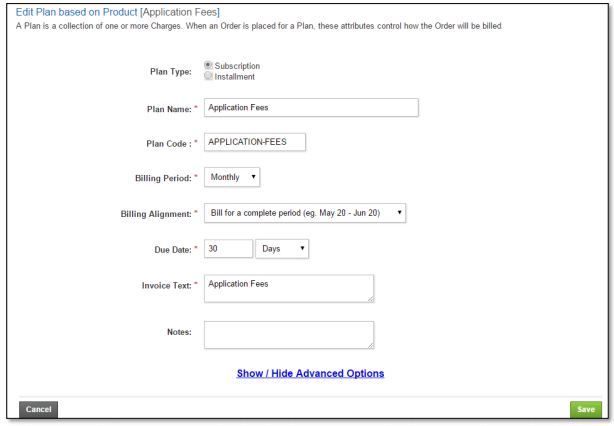 Due Date: The due date defines when the Invoice is due to be paid. 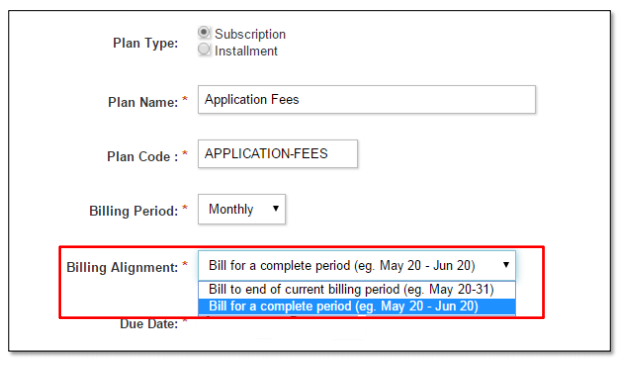 The Due Date also depends on the Charge configurations of Prepaid and Postpaid. 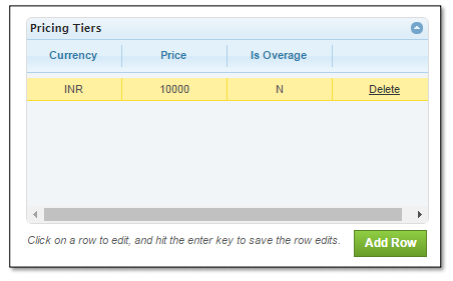 If the Due Date is set to 0, the invoice will be due as soon as it's generated. For eg, in this case the Invoice has to be paid within 15 Days of its Invoice Date. 10. Notes: This field will allow you to enter some Plan specific notes for your reference. 11. Plan Start Date & Plan End Date: These fields are used to determine the validity of the plan. In this example, this plan is valid from 01/01/2016 to 12/31/2016. When an Order is generated, the system will only show the plans which are within the validity of the Plan. 12. 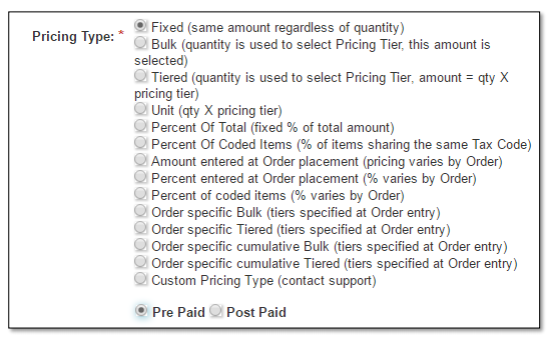 Disabled for new orders: If this field is enabled, these plans can be used only be used for the first time creation of an Order only. 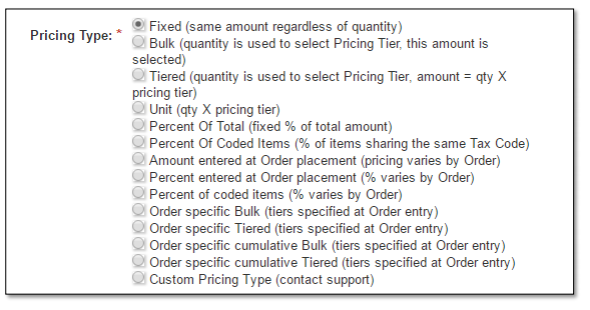 After the Orders are created using these plans, these plans will be Disabled for new Orders. 13. 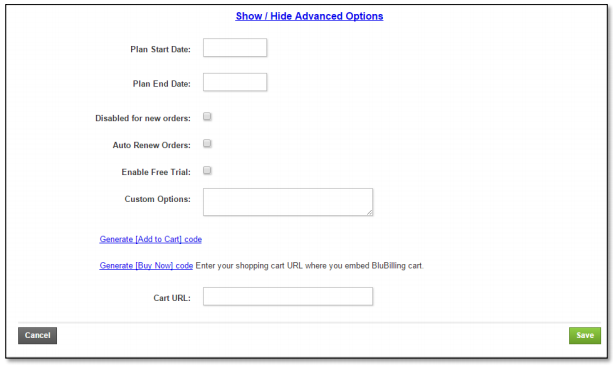 Auto Renew Orders: This field when enabled allows you to send out notifications to your customers who have their Credit Card on file. The customers can be notified that their plan is about to expire and will again be Auto Renewed and charged accordingly unless they want to intervene and ask for it to be stopped. For Eg: If your customer has bought your services for a period of 2 years and to be renewed after every 1 year, this field can be used to send a notification to your customer after 2 years and tell them that they will be charged unless intervened to stop. 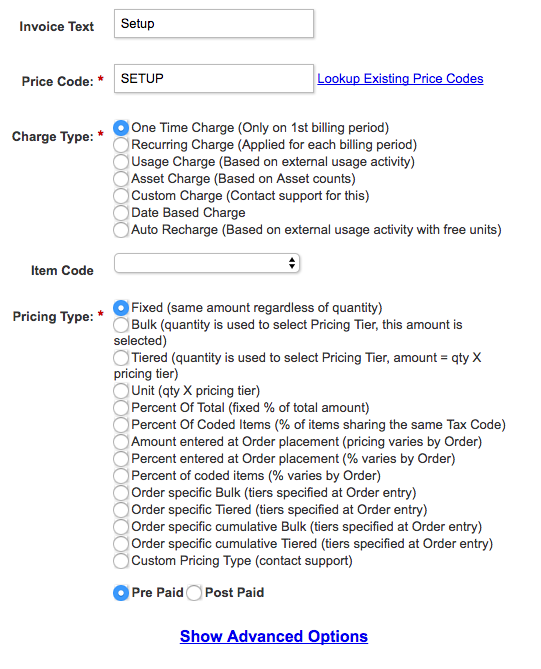 Let us start with the first charge ‘One time setup fee $500’ and explain how this charge is setup in the system. 17. Charge Type: Since this charge is a One Time Charge, the same needs to be chosen. 20. 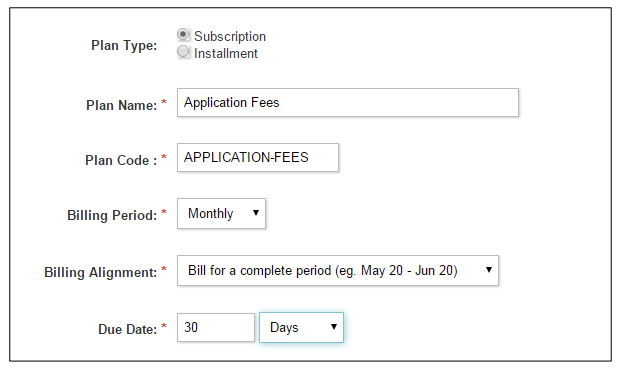 Post Paid: This option can be considered if your business model is for the customer to pay at the end of his Billing Period (Monthly) which is unlikely in this case. Hence this option is not chosen. Now a price has to be set for this charge which can be done as below. 21. Notes: You can input some notes relevant to you charge in this field for your reference. 22. Quantity: This field can be used to set a Minimum, Standard and Maximum limits to the quantity entered against this charge. A Minimum qty if entered means that at the time of Order generation, a minimum qty equivalent to what ever entered in the field has to be entered at the time of Order generation. A Standard qty if entered means that at the time of Order generation, a Standard qty will be defaulted. A Maximum qty if entered means that at the time of Order generation, a Maximum limit will exist equivalent to what ever entered in the field above which the Order will not be created. 25. 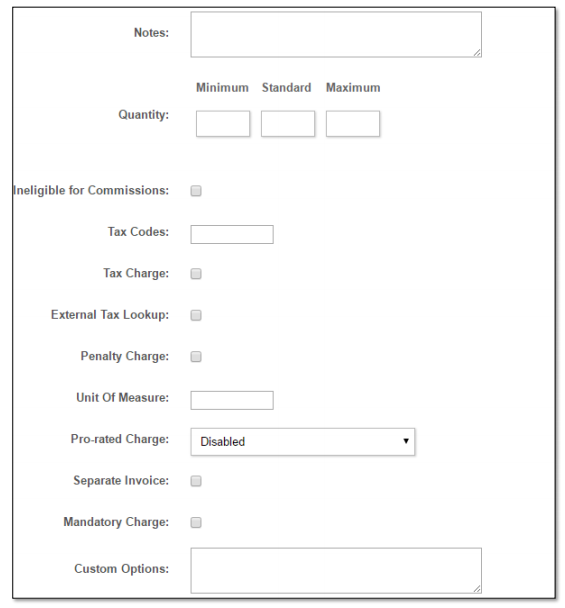 External tax Lookup: This field when checked indicates that the system has to calculate the Tax from an external source such as Avalara. 27. Pro-rated Charge: This field is used to indicate whether this charge can be calculated on a Pro-rated basis. For example, if a customer signs up for the product in the middle of a month but your company bills on the 1st of every month, then the system will only calculate the charges from the middle of the month till the end of the month. If this is left disabled, the system will calculate the complete amount irrespective of when your customer signs up. 28. 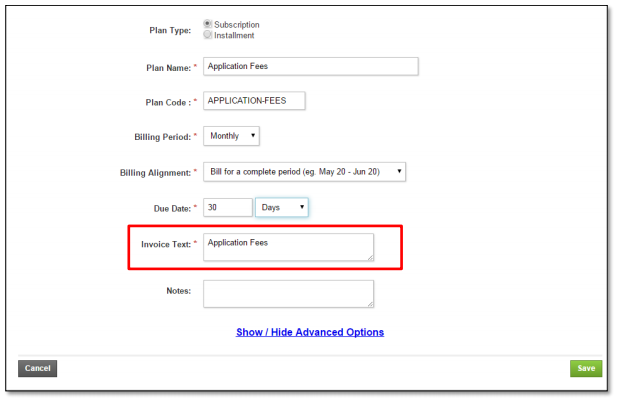 Separate Invoice: This field when checked indicates that the Order needs to generate a separate Invoice for this charge which is likely in this case because the other 2 charges for this plan are Recurring charges and only this charge is a One Time Charge. If your customer would like to have the One Time Charge in the same invoice, please leave this field unchecked.